Really one of most incredible has to be those little hand held corn tortillas doubled up and wrapped around some outrageous grilled, seasoned meat . 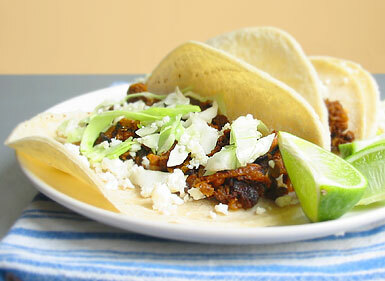 Taco’s, and I don’t mean taco bell style, are simple, delicious and often spicy. Sure horchata and fruit sodas are great with a pair of carnitas tacos but beer is perfect for cooling those spicy salsa verdes and rojos. With this spicy chorizo tacos I prefer a nice light beer something that goes down smooth. The 2xipa by Southern Tier is a great bier. Citrusy and clean with its great finish it is perfect as many of their beers are. 1. Spread your chorizo out in a pan and render out all of that good fat in the meat over a medium low heat. The meat should begin to cook and the pan will fill with all that great amber colored fat. 2. Add your tomatoes and peppers and cook them down a bit until they soften a bit. Meanwhile stack your tortillas and place them in a the oven to warm. cook the mix for 5 mins and cut the heat off. 3. Rinse your cilantro and shake dry. Rough chop the cilantro and place it in a bowl with the onions. You can mix the two or keep them seperate depending on how you feel about raw onions on your food. 4. Use two tortillas per taco add some chorizo mixture and top with cilantro and onion. Pop a beer and enjoy.